This is what global warming feels like. Last month was the hottest August on record, topping out the hottest summer on record, according to data released on Thursday by the National Oceanic and Atmospheric Administration. It was the sixth month this year to set a new record: February, March, May, June, July, and August. This has been the hottest start to a year on record and the hottest 12 months on record. It follows the hottest calendar year (2014), and the hottest decade. In 136 years of global temperature data, we are in uncharted territory. And this year’s extremes are likely to continue as a strong El Niño weather pattern in the Pacific Ocean continues to rip more heat into the atmosphere. There’s now a 97 percent chance that 2015 will set yet another record, according to NOAA. The animation below shows the earth’s warming climate, recorded in monthly measurements from land and sea dating back to 1880. Temperatures are displayed in degrees above or below the 20th century average. Thirteen of the 14 hottest years have come in the 21st century, and 2015 is on track to raise the bar again. Results from the world’s top monitoring agencies vary slightly. 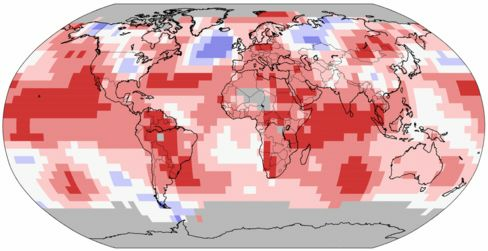 NOAA and the Japan Meteorological Agency both listed August as the hottest month. NASA rated it one degree cooler than the previous record, set last year. All three agencies agree that 2015 is on track to be the hottest yet, by a long shot. The heat was experienced differently across the world, but few places escaped it altogether. The map below shows a few purple spots of cooler-than-average temperatures—notably the U.S. Midwest—and plenty of record-breaking red. The massive stretch of crimson in the Pacific Ocean is the footprint of El Niño. As part of Thursday’s report, the U.S. predicted that drought will persist across most of California, where wildfires continue to spread. Warmer temperatures in the mountains of California can affect snowpack there, and its unclear whether this year’s snowpack will materialize. The state is now in its fourth year of drought, and snow is needed to provide the state with water throughout the year. Debilitating drought has also ravaged Brazil and Australia. In the Arctic, sea ice volume dropped to the fourth-smallest level for August since record-keeping began in 1979. The Antarctic, which had been experiencing large sea-ice growth in winter months in past years, also came in below-average.